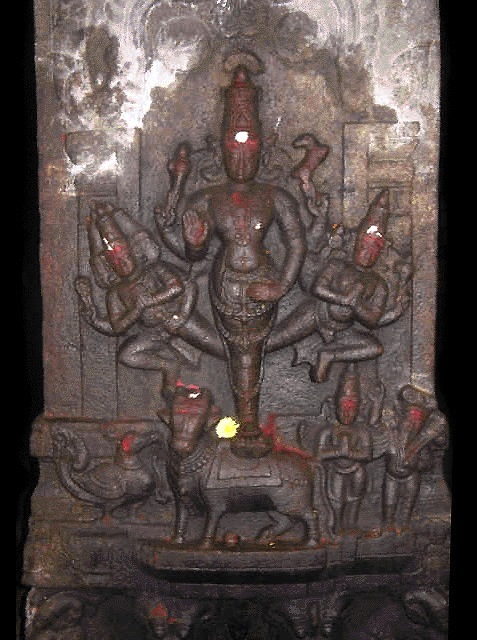 From what I have researched so far,Aja Ekapada is considered as one of the Rudras of Lord Shiva.The various forms which depicts include Ekapada Shiva,the one legged shiva,the ekapad trimurthy(Brahma and Visnu emerges from the sides).Most scholars agree that Aja Ekapada is a deity of vedic origin.However,there is not much information about why Lord Shiva is represented in this rare form and why this deity is not worshiped by most people unlike Bhairava. Aja Ekapada is mentioned in Rig-Veda 2.31.6 and Atharva-Veda Kanda 13- Sukta 1- Mantra 6. Rohita gave the Earth and Heavens their being. There Para- meshthin held the cord extended. Thereon reposeth Aja Ekapāda. He with his might hath stab-lished Earth and Heaven. According to sources The evolution of Ekapada is unclear; however, most scholars agree that The Ekapada form of Shiva originated from the Vedic deity Aja Ekapada or Ajaikapada, a name that Ekapada Bhairava still inherits. Aja Ekapada also means one-footed unborn/unmanifested one and almost always associated with Ahi Budhnya – the serpent of the ocean. In his book Vedic Mythology -Page 73- the author Arthur Anthony Macdonell gives us insight about the deity Aja Ekapada. He is mentioning Aja Ekapada as deity as supporter of the Sky ,the stream ,the oceanic waters and suggests us that Aja Ekapada is arial deity. The author in the above book is mentioning views of Various Western Indologists about the exact identity of Aja Ekapada deity. There are different opinions , according to some of them he is Sun God , a kind of Agni (fire) , Durga (goddess) etc. Aja Ekapada is is also name of one of the eleven Rudras an epithet of Lord Shiva.Here are the excerpts from the book. In Atharva-Veda Aja Ekapada is said to have made firm the two worlds (AV 13.1.6) .The TB 3.1.2.8 speaks as having risen in the east.The commentator on this passage defines Aja Ekapada as kind of Agni and Durga On Nirukta 12,29 interprets him as a sun.Yaksha himself does not express an opinion as what Aja Ekapada represents ,merely explaining him Aja as ajana ,driving ,and ekapada as " He who has one foot" OR "He who protects or Drinks with one foot. Though hardly any longer an independent deity Aja Ekapada as well as Ahi budhnya receives a libation in the domestic ritual. In the epic Ajaikapad is both the Name of one of the eleven Rudras and an epithet of Shiva. In above passage the author is giving answer to your question "not much information about its origin and why this deity is not very popular " as this Aja Ekapada deity is no longer is an independent deity .And Only worshiped popularly as form of Shiva or Rudra. The sister of Váchaspati, lovely and virtuous, Yogasiddhá, who pervades the wholes world without being devoted to it, was the wife of Prabhása, the eighth of the Vasus, and bore to him the patriarch Viswakarmá, the author of a thousand arts, the mechanist of the gods, the fabricator of all ornaments, the chief of artists, the constructor of the self-moving chariots of the deities, and by whose skill men obtain subsistence. Ajaikapád, Ahirvradhna, and the wise Rudra Twasht́ri, were born; and the self-born son of Twashtri was also the celebrated Viśwarúpa. There are eleven well-known Rudras, lords of the three worlds, or Hara, Bahurúpa, Tryambaka, Aparájita, Vrishakapi, Sambhu, Kaparddí, Raivata, Mrigavyádha, Sarva, and Kapáli; but there are a hundred appellations of the immeasurably mighty Rudras. The text does say in the end that there are a hundred appellations of the mighty Rudras so Aja-ekpada may also be one of those. Not the answer you're looking for? Browse other questions tagged vedas shiva shiva-purana vedic-gods .